Motto: "Real Fun Real Colorado "
The current mining operation is conducted by Cripple Creek and Victor Gold Mining Company (CC&V). The mine operates 24 hours a day, 365 days a year. Mine operations, maintenance, and processing departments work a rotating day/night schedule in 12-hour shifts. In the city the population was spread out with 22.2% under the age of 18, 10.4% from 18 to 24, 29.2% from 25 to 44, 30.2% from 45 to 64, and 8.0% who were 65 years of age or older. The median age was 39 years. For every 100 females there were 104.2 males. For every 100 females age 18 and over, there were 100.0 males. 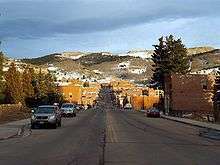 Cripple Creek is also home to the Butte Opera House, a theatre first managed by the Mackin family (previous owners of the Imperial Hotel and producers of a long-running, much-loved melodrama theatre company). 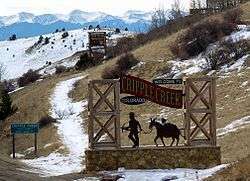 The Butte is currently the home of the Thin Air Theatre Company that produces plays year-round including such shows as A Cripple Creek Christmas Carol, Werewolves of Poverty Gulch, The Christmas Donkey and The Vampire of Cripple Creek. 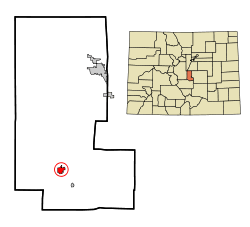 1 2 "Active Colorado Municipalities". State of Colorado, Department of Local Affairs. Archived from the original on November 22, 2010. Retrieved September 1, 2007. ↑ "Mayor and City Council". City of Cripple Creek. Retrieved December 24, 2008. ↑ Dan Plazak A Hole in the Ground with a liar at the Top (2006) ISBN 978-0-87480-840-7 (contains a chapter on the Mt. Pisgah hoax). ↑ Robert "Bob" Womack of Colorado by Joyce and Linda Womack. Retrieved March 11, 2010. ↑ . Retrieved May 22, 2014. ↑ State Historical Fund, Office of Archaeology and Historic Preservation, Colorado Historical Society, USA. ↑ Dawson, John Frank. Place names in Colorado: why 700 communities were so named, 150 of Spanish or Indian origin. Denver, CO: The J. Frank Dawson Publishing Co. p. 16. ↑ Feitz, L., (1968), Cripple Creek Railroads: The Rail Systems of the Gold Camp, Little London Press, Colorado Springs, ISBN 0-936564-15-6. ↑ "Cripple Creek-Victor School District". 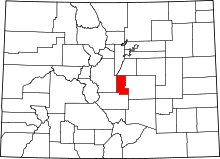 Cripple Creek-Victor School District. Retrieved 2016-01-01.